If your life has felt like a hot mess this year, you’re not alone. Same goes for the Arctic, which month after month has seen its ice cover contract to new lows. By late September, Arctic sea ice may reach its lowest extent since satellite record-keeping began. And that’s got scientists in a tizzy, because if there’s one thing geologic history has taught us, it’s that sudden drops in Arctic ice cover are often the tip of the proverbial iceberg for a whole slew of planetary feedbacks. It’s difficult to keep up with all the climate-related records our world has been smashing, so here’s a quick recap of what’s been happening up north. At the close of 2015 (currently the hottest year in recorded history, but not for long), the Arctic was already sweating iceberg-shaped bullets, thanks to freakishly warm weather brought on by a combination of a monster El Niño and the underlying global warming trend. Then 2016 burst on the scene, with temperatures at the North Pole rising some fifty degrees Fahrenheit above normal. The Arctic stayed exceptionally hot through January and February. By the time March rolled around, the atmosphere was loaded with heat, and Arctic sea ice was already starting to look thin. 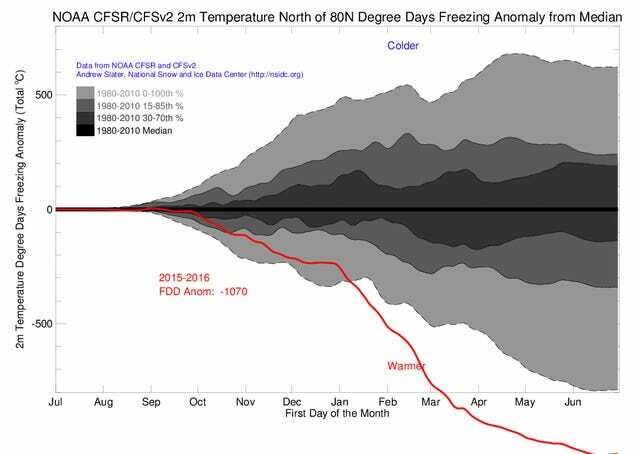 NASA confirmed that it was indeed the smallest wintertime Arctic sea ice extent on the record books, peaking at some 5.6 million square miles (14.5 million square km). Then, the Arctic started to melt. And it kept going, and going, and going, smashing record after record, month after month. As of this writing, we’ve just come off the fifth record-low sea ice month this year. Every month except March has marked an all-time monthly low, with June sea ice maxing out a full 100,000 square miles (260,000 square kilometers) below the previous record low, set in 2010. 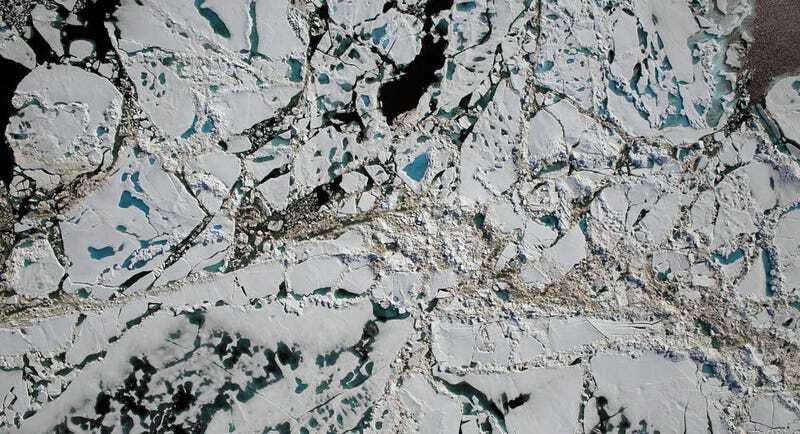 June sea ice was also 525,000 square miles (1.36 million square km) below the 1981-2010 average. Put another way, a Texas-sized chunk of sea ice has disappeared from our planet’s north pole between the early 1980s and today. “Regardless, it’s going to be a very low ice year,” Myer continued. “Which is fitting with what we’ve seen over the last fifteen years and beyond.” If recent trends are any indicator, we’re speeding toward a future free of summertime sea ice by mid-century, and all of the complex feedbacks that go along with it. This melt-driven feedback loop is likely contributing to the rapid warming we’re seeing in the Arctic—approximately three times the globally-averaged rate. Rapid warming up north, in turn, is contributing to profound shifts on land, including a greening of the Arctic tundra, the collapse of permafrost banks along Alaska’s northern shores and elsewhere, and an intensification of fire season. “Both fire [increases] and greening are happening on a continental scale,” said Charles Miller, an Arctic ecologist at the Jet Propulsion Laboratory. However, as the National Snow and Ice Data Center’s Julienne Stroeve told Gizmodo, these links are still controversial. “Everybody agrees that we should see an effect, but whether or not the signal has emerged above the chaotic climate system is not clear,” she told Gizmodo. Climate feedbacks aside, the rapid disintegration of Arctic sea ice will have a dramatic impact on the ecology of this unique part of our planet. The ice shelf is home to numerous charismatic megafauna, including Pacific walruses and polar bears, which are having to swim further and expend more energy to find a meal. Meanwhile, at the other end of the food chain, biologists are starting to worry about subtle changes in ice algae blooms affecting the reproduction of tiny, algae-eating crustaceans called copepods. This in turn could reduce the food supply for everything from seabirds to whales. It’s a domino effect for the plants, animals, and ecosystems of the Arctic, and for the planet at large. And let’s not forget who else that planet supports: all of us.